How to restore a previous version of an Infopath form when changes were made to the template? We are working on a SharePoint 2013 Environment. We recently made changes to the form template and published it. We are able to access the new template by opening up a new form from the Document library but the Issue is that it has also updated forms that were submitted previously to the document library. 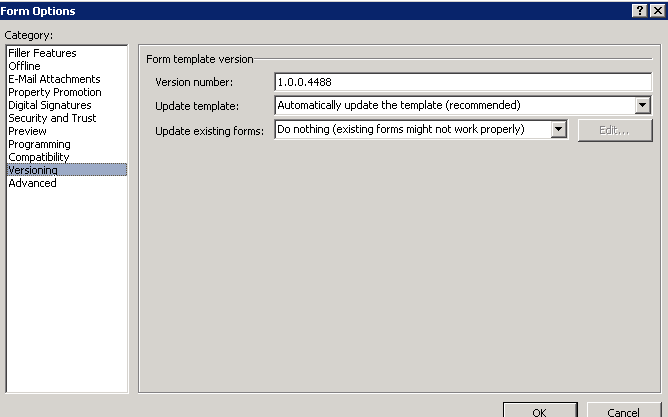 I checked the Form Option (Versioning) settings in Infopath and it is set to "Do Nothing" to update existing forms. Not sure how the existing forms got updated. Anyways I really need to restore the existing forms to the previous version. Any help on this matter would be greatly appreciated! Per my testing results in SharePoint 2013, all existing forms created from the template will automatically use the latest form template of the library. Only the uploaded forms will not be updated by default. To restore the template for the existing forms, you need to manually re-store the template file to previous one as the template file doesn't have versioning history. Publish the old template to a new form library, and then move the existing forms to this new library. Relink the forms in the new document library to the the published form template. 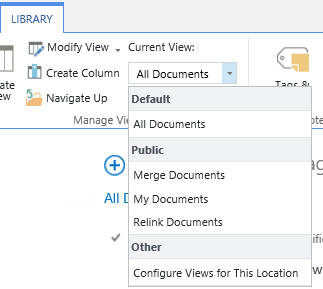 In the Relink column, select the check box for each form that you want to link to the new form template. On the list toolbar, click Relink. After the files are relinked to the previous template, you can download the files and upload them back to the original library if you want. The form template of the uploaded forms will not be updated if you update the form template of the library unless relinking the files. Not the answer you're looking for? Browse other questions tagged sharepoint-server infopath versioning or ask your own question. InfoPath Form losing content type - what is the cause? Accidentally published wrong InfoPath form! Missing data! HELP!